A New Orleans wastewater partnership with Veolia Water was recently recognized for excellence by the U.S. Conference of Mayors (USCM). 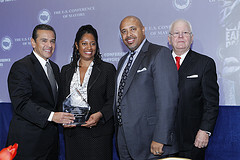 USCM presented the city and Veolia Water with an award for excellence in public/private partnerships. The environmental challenges of New Orleans are different than most U.S. cities, as New Orleans sits below sea level in an area where hurricanes are a major problem and average rainfall exceeds 60 in. per year. This makes the operation and management of the city’s wastewater facilities, which by design must deal with heavy rains and flooding, a very important role. To help meet these challenges, a partnership was formed between Veolia Water and New Orleans’ Sewerage and Water Board in 1992, when the city contracted the operation of its two wastewater treatment plants to Veolia Water. With a combined treatment capacity of 132 million gal per day, the project remains one of the largest in North America. USCM, the official non-partisan organization representing U.S. cities, acknowledged the outstanding achievements made possible by this partnership, which include maintaining consistent environmental compliance with state and U.S. Environmental Protection Agency regulations, leveraging environmental expertise on a new environmental project, generating $26 million in overall savings and promoting environmental operations during Hurricane Katrina.